Quality is the keyword when you deal with The Saw Shop. We only sell high quality blades and tools. We have carefully selected blades that we can sell to you with confidence - if we like it, then you can be assured you will like it too. We demand a lot of our suppliers so that we can give you a good service and at sensible prices. It's not about what is cheapest - it is about what is good quality and good value for money. 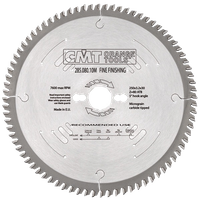 We are pleased to be able to supply you with CMT TCT Blades which we feel are amongst the best blades available. We have listed the most popular ones here on the site, but almost any TCT Blade can be supplied if you require something out of the ordinary. Our range of new HSS Blades cover all sizes and applications for manual and automatic cut-off saws. Broaching Cutters can be bought straight from our site. We offer a full range of sizes in both standard and long-reach. High quality new guillotine blades are essential for Print Finishing and The Saw Shop sell only the best quality. We can offer a fast deliver service on all the popular blades - often within 24 hours. If you need printer's cutting sticks, then The Saw Shop should be the first place you look for high quality ones. We have a full range of colours and sizes available, but our top selling range is Vision Clear, which is suitable for both HSS and TCT guillotine blades. We can also supply Planer Blades, Profile Cutters, Router Bits and Bandsaw Blades for just about any application you could ever need.